Wow, how ironic that your battery died in the Capela dos Ossos! That’s eerie! Thanks for your comment, Curt! Hope you and Peggy had a nice weekend. That looks like a fun day! I don’t know if I could have one of those experimental travel days. I need an itinerary. That said, Altanejo and that whole area seem fascinating. Not your usual travel places when it comes to Portugal. Thanks, Camila! Yes, we were definitely off the beaten path a bit. On our way back through (two weeks later) we came across a field full of red poppies and a beautiful hilltop village. It was so amazing! Can’t wait to post it — coming soon! Thanks for reading and sharing your thoughts. I’ll keep an eye out for it! Sounds lovely! I’ll be spending two weeks in Portugal in February. Thanks for such a helpful post. I’ll be rereading it before I go. Hey Shelley! Hope you have a wonderful trip to Portugal! Happy to know you’ve found this post helpful. Thanks for reading and getting in touch! Happy you enjoyed it, Michael. Thank you for reading! This has been a very pleasant read and feast for the eyes, Kelly. That stop at the hilltop castle was such an interesting ‘discovery’, and the rug making tradition in Arraiolos is really fascinating! It’s amazing how they managed to uncover those beautiful mosaic tiles! As for Capela dos Ossos, despite its sinister atmosphere it does look very intriguing. What a trip you had! This shows that sometimes (or most of the times?) the most rewarding trips are those without strict itineraries. Thanks so much, Bama! Agreed — the rug making in Arraiolos is really intriguing and so unusual as a form of embroidery. It’s really fun to discover how different cultures interpret similar crafts. Totally agree with your point about not having a strict itinerary. I think spontaneity in travel is highly under-rated. Thanks for your comment! Thanks, K.M.! Yes! Book a ticket! There’s so much to love about Portugal. Thanks for your comment! A lovely post Kelly. I traveled with you for the day, feeling your sense of freedom and easy pace, stopping here and there to see whatever enticed you. And what variety you found! I love the carpets – exquisite. The bones not so much. Some where in Europe (maybe Prague?) is a church full of bones, even chandeliers made from bones. The poem was very a propos. Thanks, Alison! Agreed, I thought the poem was frightfully on point. I couldn’t not include it! Happy you enjoyed the post. Wish I had more photos of rugs to share. I think I decided to put the camera down in the museum so I could take it all in, but I left with hardly anything to show. Oh well. Thanks for your comment! What a lovely day and terrific collage of sights along the way. I really love tge okd photo shoeing the vats for dying the rugs in the street. It reminds me of the still current vats we saw years back (for dying leather) in Morocco. 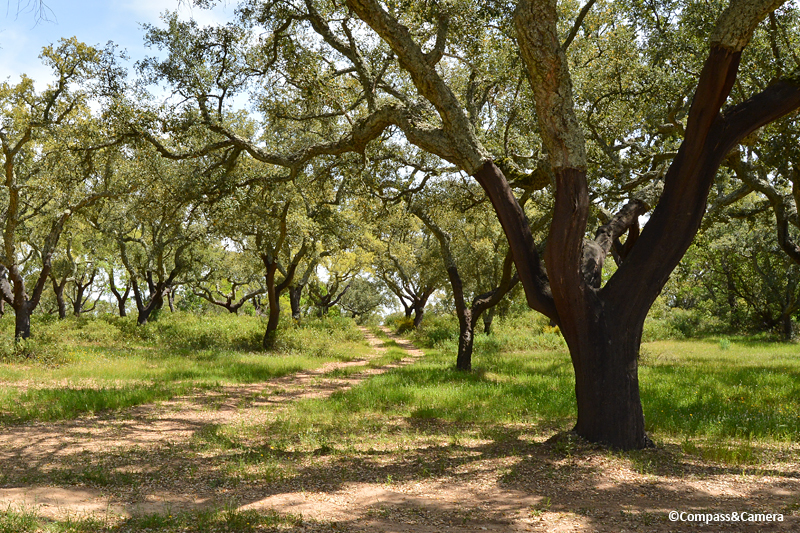 The cork trees are such a wonderful sustainable material. As a child my bedroom floor in South Africa had a beautiful spft cork floor. It felt like walking on a cloud! So much beauty in Portugal and you certainly captured it….and the feeling of being right there jumps right out of this post! Thanks, Peta! Funny you mention the dying vats in Morocco — I almost mentioned them in this post. We saw them in Fes about a week after this day in Arraiolos. They are very similar. Although Portugal and Morocco are separated by the Strait of Gibraltar, there is so much tangible cross-cultural influence. It’s such an interesting region! And yes … cork floors! Aren’t they sublime! Lucky you to grow up with that material under your feet! Great to hear from you. ~K. It gave me a warm feeling reading this. 🙂 🙂 A few years ago we stayed at Constancia, near Tomar, and were not too far from Arraiolos. I remember seeing signs from the castelo at Almourel but the other half had had enough driving for the day. I love your photo of the old guys on the bench. If I’m up that way again I’ll go looking for them. Evora is beautiful too. Thanks for sharing! Thanks, Jo! Very sweet comment. 🙂 Yes! Look for the old guys! They were all sitting there, so bright and early, dressed for the day, but hardly talking to each other. Would love to know their stories. There was another group standing under a tree nearby, but the two groups did not mix. Different sides of the tracks, maybe? Or childhood grudges? Who knows … life in a small town! Thanks for reading and sharing your thoughts! Perfect day summarized in a perfect post of prose and photos … and the ending poem could not have been more fitting itself! I love days like this, and we had a few on our own road trip in September in Central Europe. We had bones, too, in creepy piles underground in Vienna (we never made it to the creepiest place of all – Kutna Hora near Prague, to which Alison referred). When I first opened the post, I loved the sweeping tail of a wall in the first photo and was brought up short when you called it “modest.” Then I looked at the following pictures and saw what you meant about its scale, and I admired your phrasing when you said it looked “as if the architect was motivated more by aesthetics rather than fear.” So good! Thank you, Lex! Happy you enjoyed the post. Kutna Hora! That’s it! I couldn’t remember the name and didn’t get there when I was in Prague. No matter — I think I’m done with ossuaries. 🙂 Thanks for your thoughts about my wording related to the castle wall. It was really thought provoking because it isn’t an insurmountable wall. It could have been easily scaled so there has to be some other reason for its construction. I’m guessing there wasn’t much of a threat from the outside, or maybe they just couldn’t have a castle without a wall so they built one that was demure and beautiful. Or maybe the engineer did the math, based on the volume of stones, and determined that it couldn’t be very tall. That being said, it seems like the wall could have had a much smaller diameter around the castle but then again we have no idea what was held within the wall — it might have been an entire village. Such a mystery but so fun to think about! There certainly is a lot of beauty and history in Portugal. We had but a small sip of it a few years back, it’d be nice to have the freedom of an exploration day or two. As for the ossuaries, I’ve never quite been able to figure out why folks would want to end up separated and stacked like that. For that matter, I remember the first time I encountered the finger bones of a presumed saint in a German church, 37 years ago. It’s still a mystery to me why folks would want such a thing, or be willing to dissect their religious heroes. Seems disrespectful somehow, and I’m not sure the saint would approve. Portugal is so remarkable, Kelly! Discovering such hidden gems is a real treasure. 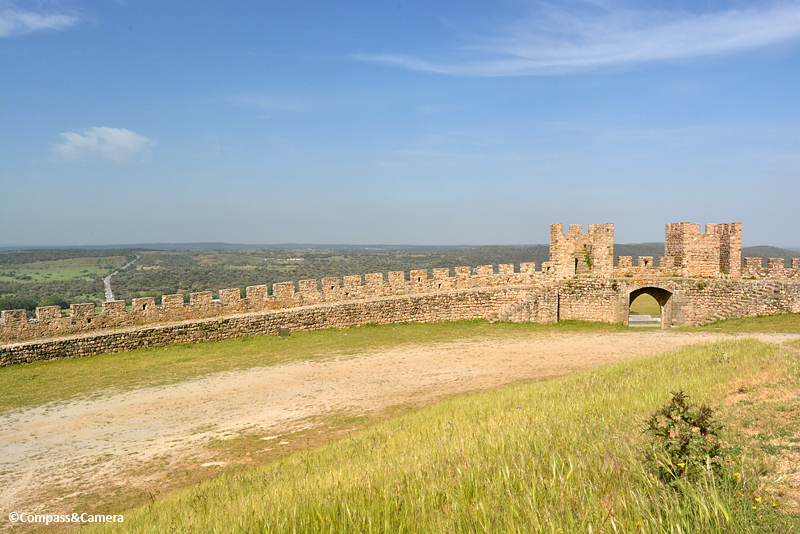 Alentejo seems definitely worth exploring! Definitely, Agness! Thanks for reading and sharing your thoughts. Good post, I enjoyed reading it. I must put this region on my to do list when I return to Portugal. Thanks, Andrew! Lucky you … “when I return to Portugal.” I hope I get to return someday, too! Thanks for your comment.